Store bough Pita bread never comes closer to the home made ones !! I always love making pita at home as they are softer and yummier . Many complains their pita never puffs up and that’s why they can’t have pita pocket . Hmmmm … But by the grace of Allah , my pitas always , almost always puffed up nice . I tried both on stove top and oven . Found in oven it puffs up nicer than the stove top . Yester day I made 4 pitas . 2 of them in the oven and 2 of them on stove top . Oven versions are puffier than the stove top , but stove top ones puffed up as well . You just need to follow some tips in order to get the puffier pitas with pocket . Just go through the tips after reading the recipe . 1. In a bowl add 1/2 cup warm milk . Add the honey and yeast . Now add 1/2 cup of flour and stir . Mix well . It will look like a batter . Now cover the bowl and let it rest for 30 minutes . After 30 minutes , you will see bubbles are all over and the batter rose and looks like sponge . 2. Add salt on the sponge .Start adding flour little by little . You may not need the whole remaining flour . So add little by little and knead . When you will end up with soft , pilable dough stop . Now knead very well . Add the 1 tbl spoon oil and keep kneading . The softer your dough is , the softer is your pita . make a ball from the dough . 3. Now rub some oil over the ball and keep it in a oiled closed lid box to let it rise again . Keep it in a warm place to rise faster . Within an hour you will find the ball has risen . 4. Punch down all the air from the ball and make 4 balls from it . Cover the balls with a wet cloth and keep it like this for 15 minutes . 5. Roll the balls to disk evenly on a flour dusted surface and fry on the cast iron skillent or fry pan on medium flame . Cover the lid and let it fry for 2 minutes . Turn it over and again cover the lid . You will see the pita is piffing up . Don’t forget to heat the frying pan well, otherwise pita won’t puff up . For puffing up too hot griddle/ pan is needed. 6. If you bake it , pre heat the oven to 450 FH . Place the baking tray in the oven too . Now roll the pita bread evenly and place it on the hot baking tray and bake for 3 minnutes or until puffs up . Try to roll the pitas thin . The thinner is puffier . After 3 minutes just turn over the pita and bake another 1 minute . Take it out from the oven . And cover all the pitas with a kitchen towel to keep them softer . 1. Please don’t skip the sponge making step . Pitas are softer and nicer if made by sponge method . It helps to puff up too . 2. Try to roll the pita evenly . 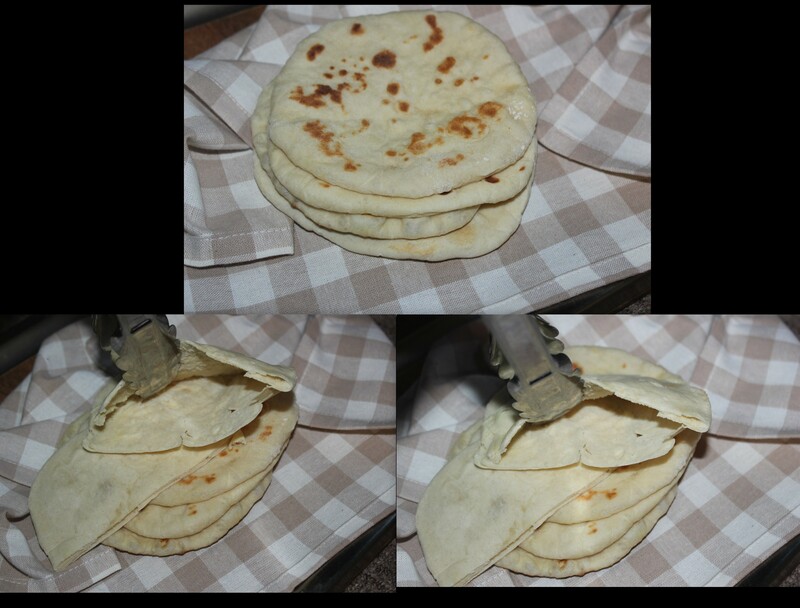 If not rolled evenly , a little thicker is here , a little thinner is there, pita will not puff up . 3. Try to roll the pita thinner . The thinner is puffier . 4. There must be no crack on the pita while frying or baking . 5. Very , very important , make sure the oven is really very hot before you bake the pita . If the oven is not hot enough , the pita won’t puff up . Same way , try to ensure the frying pan , or cast iron griddle is too hot before you fry the pitas on stove top . This entry was posted in Breakfast and tagged homemade Pita, Pita bread. Bookmark the permalink. I was wondering can I make the pitas before hand and warm them up when guests arrive?? will they taste the same or will be tough?